Brazil’s President Dilma Rousseff on Monday defended the state oil and gas giant Petrobras, in the eye of a storm over an allegedly ‘overpriced’ purchase of a refinery in the United States. On the maiden voyage of a new Petrobras oil ship in Pernambuco state, Rousseff assured that the accusations involving the company would be investigated, but also said she believed such scandals were being used for political purposes. “I will not refrain from fighting any kind of crime, no matter who committed it, but I will not tolerate the campaign of those who damaged the image of this company, which our people built with sweat and tears, for political gains,” she said. Rousseff was chairwoman of the Petrobras’ board at the time of the 2006 purchase of the oil refinery in Texas and the opposition members are now using it to weaken Rousseff’s campaign ahead of the polls in October. “Petrobras is bigger than any of us, it is the size of Brazil. 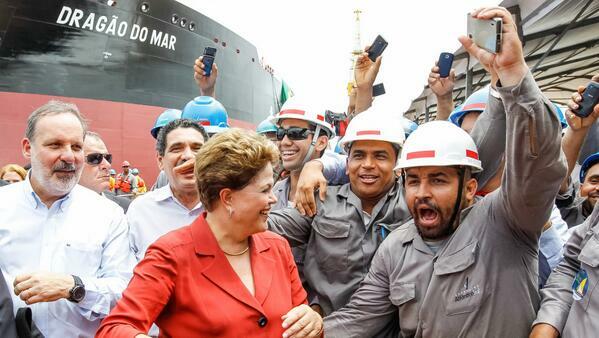 We believe in the ability of Petrobras, the Brazilian workers and entrepreneurs,” she said on Monday. Rousseff said she will vigorously defend the company, but stressed that should any wrongdoing be uncovered, it will result in exemplary punishment, highlighting the work of the courts and of the Federal Police. As the purchase of the US refinery in Pasadena took place while President Rousseff was on the company’s board, the scandal could hit her personal approval ratings as she prepares to run for a second four-year presidential term in October.